Hire the latest Data Projectors to suit all of your needs. We stock over 29 types of projectors ready for rental in Surrey. From small Laptop with VGA and HDMI projectors to large full HD HDMI or SDI projectors. Call or email today for more information on how to hire a projector. 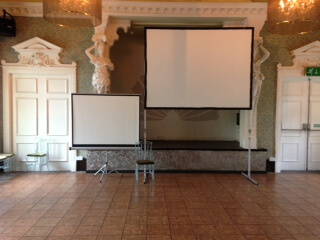 Projector hire for every event. We supply and hire the latest projectors for conferences, presentations and special events using the latest technology from the lead manufactures to ensure the best quality presentation. You will need to tell us what the projector is needed for and what sizes screen you are projecting on so we can quote you on the best projector for your needs. We have the biggest elections of screens for in Surrey. So if you need to pick up a little tripod screen or you have an event that requires some of bigger. We have been hiring screens to Surrey for 12 years. With us we have an array of different types of screens to hire. Are we offer a complete free advice on what screen is best for you. We do not just tell you what we have in stock. We try to advise you on the right screen for your event. Even if it means us not being able to supply. We have lots of TV screens for hire on 6ft stands. So we have many different sizes of projection screens. From 6 ft to 26 ft. So we will always have the right screen for your event. Our Surrey projector hire and screen hire range will suit any meeting, conference, exhibition, party, conference, classroom. With high brightness projectors for large, well lit environments, and low brightness projectors for smaller rooms we know you will find a projector here to suit your projector rental needs. Are you looking to Hire a small or large projector screen hire in Surrey ? A smaller screen which you can collect from our Surrey based AV company in Sunbury we have screens from 6 ft by 4 ft. We have bigger screens for Hire which we prefer to set up for you. Also we have a large stock of TV screens on stands. The stands reach 6-ft high in the air so everyone can see over each other’s heads in a conference situation.